France’s acclaimed architect of fragrance, Francis Kurkdjian, launched his stellar career more than 20 years ago with an ambitious recreation of Marie Antoinette’s perfume. Taking an olfactory tour to the 17th century and back again, he began composing ethereal and spectacular scents for world-famous fashion houses, before opening his own Maison in 2009. Guided by Kurkdjian’s hallmarks of sophistication, purity, timelessness, and reinvented classicism, Maison Francis Kurkdjian’s wardrobe of fragrances is a celebration of life in all its glory. 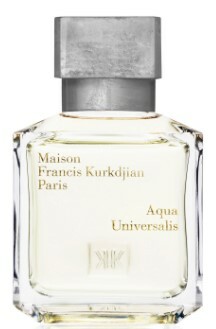 Contemporary and imaginative, but within the traditions of the finest French perfumery, every Francis Kurkdjian creation is an irresistible daily ritual and sonnet of the senses. 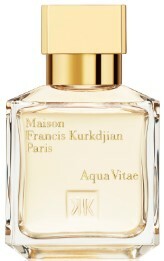 In his trio of Aqua fragrances, Francis Kurkdjian has captured the beauty of life and its most vital element – water. Like an aquatic kiss on summer skin, each perfume recharges and refreshes with the brightness of breaking waves, but then separates with a distinct personality. 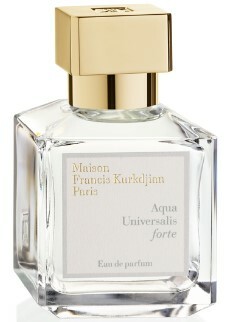 ​Fresh and airy, Aqua Universalis offers a cheerful, luminous scent that suits every person and occasion. Radiant and joyous, it delights with notes of Italian bergamot and citrus; white flowers; and light, musky woods. The forte adaptation of this Eau de Parfum features a more intense solar character, where a bouquet of roses and fresh Egyptian jasmine amplifies citrus notes infused with the heat of Italy. Bergamot from Calabria, lemon from Sicily, white flower bouquet (lily of the valley, mock orange), light and musky woods. Lemon from Sicily, bergamot, jasmine absolute from Egypt and rose absolute from Morocco, light and musky woods. The deliciously scented Aqua Vitae uses its sunny, irresistible freshness to create a bond of attraction between two beings. It’s reminiscent of a sensual caress or shiver of pleasure, touched by the warm breath of Italian citrus and mandarin orange; musk; and carnal, woody notes. Aqua Vitae forte, a variation of the Eau de Parfum, lingers like a memory of intense emotion. It personifies the fusion between sun and water, heated with spices and citrus. Lemon from Calabria, mandarin from Sicily, hedione, guaiac wood, vanilla, Tonka bean. Bergamot and lemon from Calabria, mandarin from Sicily, ylang ylang, orange blossom, pink pepper, cardamom from Guatemala, cinnamon from Sri Lanka, sandalwood from India, benzoin from Siam, guaiac wood. Aqua Celestia is the Aqua collection’s latest opus. 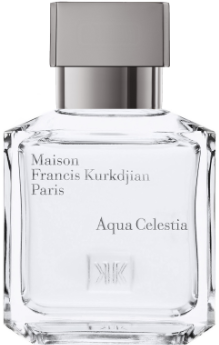 Its pure and heavenly interpretation of the vitality of water creates a bond with its earthy elements of Mexican lime, cool mint, French blackcurrant bud absolute, and mimosa absolute. Bringing radiance and intensity, the recently unveiled forte variety shines like rays of sunshine bursting between the blues of the sky and sea, with dazzling additional notes of Egyptian jasmine and petitgrain bigarade from Italy. Mexican lime, cool mint from Mitcham, blackcurrant bud absolute from Burgundy, mimosa absolute from Provence, musky accord. Lime from Mexico, cool mint from Mitcham, petitgrain bigarade from Italy, blackcurrant bud absolute from Burgundy, mimosa absolute from Provence, jasmine absolute from Egypt, musky accord.